Though times have changed and the winds have shifted, the Palace On Wheels cruises along in royal style, the kind only the Maharajas of yesteryears could have perpetuated and enjoyed. The exquisite and exclusive Palace On Wheels has luxurious cabins, wall to wall carpeting, a well stocked bar, two dining cars and a very personalized service... in fact, almost everything that could compromise of heaven on earth for seven days! It takes you on a splendind journey of Rajasthan, covering Jaipur, Jodhpur, Udaipur, Jaisalmer, the game parks of Ranthambore & Bharatapur , the World famous monument of love - The Taj Mahal at Agra & a sightseeing trip in New Delhi. Accomodation is in 14 fully air-conditioned deluxe saloons, each a combination of 4 twin bedded chambers with channel music, intercom, attached toilets, running hot and cold water, shower, wall to wall carpeting and other amenities. 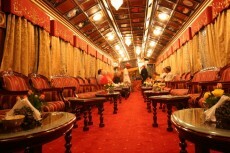 The furniture with its inlaid motifs has been specially created for the Palace on Wheels. First introduced in January 2004 on the pattern of the Palace on Wheels, the train has been benchmarked against the best luxury trains in the world like the Blue Train of South Africa,The Orient Express of Europe and the Eastern and Oriental of South East Asia. The Deccan Odyssey`s sheer luxury is a sight to behold. 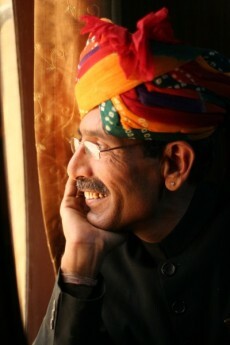 Everything in the train reflects the ways of Indian Royalty. The plush interiors, excellent cuisine and great sites to see makes the journey memorable. This luxurious train transports its guests on a remarkable sojourn of a land shining in grandeur - serene beaches, magnificent forts & palaces and experiencing divine tales etched in colossal rocks. A week long royal journey is through some of the best places in Maharashtra namely Mumbai, Ganapatipule, Ratnagiri, Sindhudurg, Tarkarli, Sawantwadi, Goa, Kolhapur, Pune, Aurangabad, Ellora, Ajanta and Nasik. Accomodation is in 13 fully air-conditioned deluxe saloons, each a combination of 4 twin bedded chambers with channel music, intercom, CD/MP3 player, attached toilets, running hot and cold water, shower, wall to wall carpeting and other amenities. Double bedded and Twin Bedded Rooms available. Welcome aboard a fascinating journey through the many worlds of Karnataka. Embark on a luxurious voyage of discovery through the cradle of Stone architecture. The Golden Chariot train named after the famous stone chariot in Hampi, a world heritage site, in Southern India will travel through timeless historical heritage sites, resplendent palaces, wildlife reserves and golden beaches. The 7 night / 8 day colourful journey begins every Monday from Bangalore & traverses through Mysore, visiting Srirangapatana and Mysore Palace, Nagarhole National Park ( Kabini) and continuing to the historical sites of Shravanabelagola, Belur - the 11th century cradle of Hoysala architecture and a world heritage site, Halebidu, Hampi and thereafter entering into the triangular heritage sites of Badami , Pattadkal, Aihole & finally to the Golden beaches of Goa before ending in Bangalore. Accomodation is in Fully air-conditioned cabins; 26 twin beds, 17 double bed cabins and 1 cabin for the physically challenged. Every cabin is equipped with Wi-Fi, LCD television, DVD with 6 satellite channels, wardrobe, vanity/writing desk and private bathroom with luxurious amenities and accessories. Contact us with your preference.